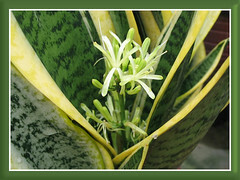 Sansevieria trifasciata ‘Golden Hahnii’ does flower after all! 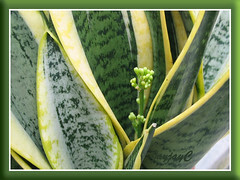 Truly, a remarkable phenomenon, very rarely seen on Birdnest cultivars of Sansevieria trifasciata. 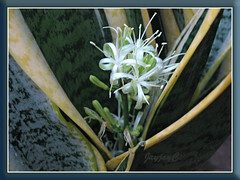 Matter of fact, even the common sansevieria, such as S. trifasciata ‘Laurentii’ and others rarely flowers. While watering our garden plants on the evening of September 8, John observed something extraordinary in our potted clusters of ‘Golden Hahnii’. He called out to me in excitement. Lo and behold, there was a 3cm-tall budding spike, peeping from within the rosette’s center of one of the ‘Golden Hahnii’ plants! 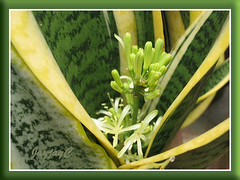 We could not believe our eyes that such a marvel was happening right before our eyes, as it was highly unlikely for a birdnest sansevieria to bloom. Nonetheless, we monitored it very closely everyday, almost giving up on seeing their flowers as the budding spike took more than two weeks which seemed like forever to reach its maximum height of 16.5cm. We proudly showed it to our sons when they came visiting, but they were not amazed at all – probably the stiff budding spike without flowers appeared plain and unappealing. Not to us gardeners, for we see beauty and wonder in even the simplest and ordinariness of nature. The beautiful blooms eventually burst forth, starting from the lower buds on September 25. Hehe, we sometimes forget that plants too have their life cycle. Like humans, there is time for everything – to grow, to mature, to dance and sing, to weep, to sleep and so on! How pretty and dainty the tiny blooms appear! Lovely star-shaped flowers with six 2cm-long petals and colored white on their upper surfaces whereas undersides, light chartreuse. They seem to sparkle from dusk onwards, thrusting their petals outwards, with tips curled downwards and inwards to display their fragile and elegant-looking stamens. Also, it is only from evening onwards that they release a very pleasant fragrance. Simply wonderful though it is only for a night. By noon the next day, the flowers become listless. However, since the buds bloom in stages, one get to enjoy them slightly longer. Probably a week from this short flowering spike which is just 16.5cm tall. 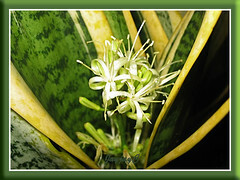 But definitely not up to a month which we had previously experienced with the fabulous blooms of Sansevieria trifasciata ‘Bantel’s Sensation’ that produced a flowering stalk, 68cm tall! Wow!